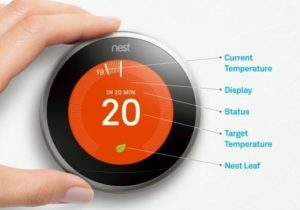 The Nest Learning Thermostat is an electronic, programmable, and self-learning Wi-Fi-enabled thermostat that optimizes heating and cooling of homes and businesses to conserve energy. It is a smart thermostat developed by Nest Labs and designed by Tony Fadell, Ben Filson, and Fred Bould. The thermostat can then learn people’s schedule, at which temperature they are used to and when. The device is based on a machine learning algorithm: for the first weeks, users have to regulate the thermostat in order to provide the reference data set. Using built-in sensors and phones’ locations, it can shift into energy-saving mode when it realizes nobody is at home. Nest made some pretty grand claims about its smart thermostat when it was first announced. The company claimed that, through a more intelligent heating system, its thermostat could reduce your energy consumption by as much as 10% and hence save you money. There are two parts to the Nest Learning Thermostat. There’s the thermostat itself, which can be fixed on the wall (in lieu of the existing thermostat for example) or displayed on an optional stand, which is sold separately. In the latter mode, you will need to put the Nest near to a power socket and within reach of your router (you will need Wi-Fi). The other part is the heat link. This is the component that will control the boiler and communicate wirelessly with the thermostat. We had the Nest Thermostat installed professionally, which the company recommends due to it needing to connect to some pretty high-voltage wires. Overall the installation took around an hour, and it was a fairly painless process for the installer to disconnect our old thermostat and install a Nest in its place. One household can have multiple zones, each with its own Nest thermostat and heat link, but most homes will probably have just the one thermostat. Nest doesn’t currently offer any connected radiator valves to allow you to fine-tune the temperature in various rooms. Nest’s Learning Thermostat also offers Family Accounts and Home/Away Assist, two new features that help improve performance. Family Accounts lets users in the same household set up their own Nest accounts (instead of the shared family accounts that the company offered previously). Once Family Accounts are created, Home/Away Assist jumps into action by tracking each person’s phone location. It isn’t exactly the same as geofencing, as there’s no geofenced range, but it does make it even easier for Nest to keep an eye on your whereabouts. Nest Learning Thermostat simply adapts itself to your routine just within a week. You turn down the heat on your way to bed. Nest gets to know what you like and starts building a schedule: cozy in the morning and cool at night. After you turned up the heat a few days in a row, Nest learned you like eating breakfast at 70º. So now it warms up the house as you get out of bed. Put a Nest Temperature Sensor in any room, like the baby’s room, and you can tell Nest to make that room a priority. Nest shows you how much energy you use every day in Energy History and every month in your Home Report. So you can see when you use more energy, like on weekends etc., and how to use less. So, this little device is your companion in your vow to save energy and perform various tasks.